Take yourself back in time to the booming days of an upstate New York railroad. 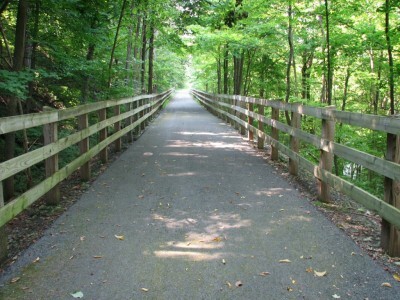 This trail runs from Johnstown to Mayfield, via Gloversville, along parts of the Cayadutta Creek. Built on the old Fonda Johnstown & Gloversville Railroad roadbed, this paved trail will take you through yesterday’s booming leather tanning industry to today’s modern industrial parks. The Vail Mills–Broadalbin segment runs from the Fulton County Visitors Center east to S. 2nd Street; a short segment also heads west from the visitors center – in total it is a 2 mile stretch.